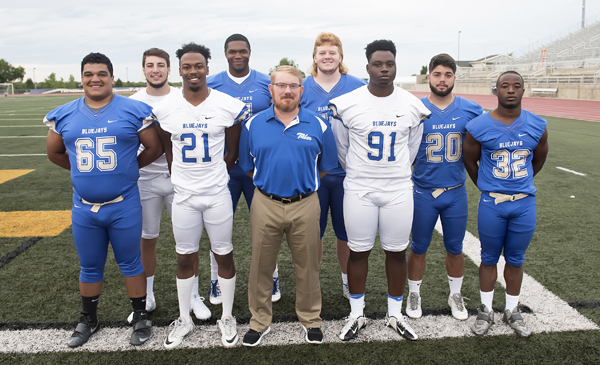 Under the direction of head football coach Mike Gardner (front row, center), these returning All-KCAC selections will anchor an experienced Tabor College squad in 2017: (front row, from left) Carlos DeLeon, Kevin Golden, coach Mike Gardner, DiMitri Bowie, Ontre’Von Cooper; (back row) Evan Sprayberry, Curry Parham, Spencer Baalman, Charles Beale. Not pictured: Zack Johnson. Tabor College is aiming to secure its third consecutive KCAC championship this season under the direction of 10th-year coach Mike Gardner. The Bluejays went 8-1 in 2016, losing only to Kansas Wesleyan in overtime, 45-42. Tabor’s season record was 8-3; all three losses were to ranked opponents, including a season-ending loss to Morningside in the first round of the NAIA Football Championship Series. The Bluejays return 43 letter-winners and 14 starters, eight on offense and six on defense, from a team that ranked among the top 10 in five categories a year ago: fourth-down conversion percentage (84.6), pass defense per game (152.4), rushing offense (2,772), rushing offense per game (252) and punt return yards per attempt. Gardner acknowledged the team returns quite a bit of experience. Tabor averaged 437.2 yards per game last year (2,772 rushing, 2,037 passing). The Bluejays outscored opponents, 410-292. Line play—Gardner said the success of his team begins up front. Spencer Baalman, a second team All-America selection and unanimous first-team All-KCAC honoree, will anchor the line. Also returning is second-team All-KCAC pick Carlos DeLeon. Quarterbacks—Curry Parham returns at quarterback for Tabor. Gardner said he’s never had a quarterback with Parham’s throwing accuracy, even on passes deep down the field. Standing 6-feet, 3-inches tall, the 250-pound senior’s size is an asset. “He’s got good enough feet and good enough instincts that tackling a guy like that one-on-one is kind of like hitting a fullback,” Gardner said. Parham averaged 155.5 passing yards per game with a 55.1 completion percentage in 2016. He threw for 1,711 yards and 21 touchdowns, earning All-KCAC honorable-mention recognition. Wide receivers—Zack Johnson will solidify the receiving corps. Tabor’s leading receiver a year ago, Johnson averaged 90.1 yards per game and earned All-KCAC second-team honors. Also returning are Charles Beale and Skylar Valencia. An All-KCAC honorable-mention selection, Beale hauled in 30 passes for 493 yards and three touchdowns, averaging 16.4 yards per catch. Valencia caught 17 passes for 180 yards and three touchdowns, averaging 10.6 yards per catch. Running backs—Ontre’Von Cooper and Drevion Cooper will bolster the running game. A second-team All-KCAC pick, Ontre’Von was Tabor’s second-leading rusher last year at 54.7 yards per game. “We’ve got the Cooper brothers, and we have some other guys who are new that I’m kind of anxious to see how they’re going to step forward,” Gardner said. Last year, Tabor ranked 24th nationally in total defense per game (345.4) and led the KCAC in pass defense per game (152.4). Line—Evan Sprayberry, the KCAC’s sack leader a year ago, returns as a first team, All-America selection to anchor the defensive line. Sprayberry led the nation in sacks (16) and sacks per game (1.5) a year ago and ranked fifth in tackles for a loss per game (2). Sprayberry recorded a team-best 22 tackles for a loss and was a unanimous All-KCAC first-team pick. DiMitri Bowie, a KCAC honorable-mention selection, also returns. Gardner said he expects depth on the line this year. Linebackers—The Blue­jays lost experience at linebacker, Gardner said, and will need to fill the voids created by the losses of Alex Neuschafer and Maurice Payne. Neuschafer was Tabor’s leading tackler in 2016 with 99. A second-team All-KCAC selection, he ranked 35th nationally in fumbles forced per game and 36th in tackles. Meanwhile, Payne led the Bluejays in interceptions with three for 65 yards and one touchdown. He earned honorable-mention All-KCAC honors a year ago. Secondary—The Bluejays return several players, including All-KCAC honorable-mention selection and 2017 preseason pick Kevin Golden, as well as Adrian Rodriguez, Antonio Mitchell and Sean Kelley. Gardner said he is still looking to solidify the nickel position. Gardner will need to replace two second-team All-KCAC special teams selections in kicker Jared Slavens and punter Trey Geiger. Gardner is optimistic about long-snapping with the return of Austin Conway and Omar Galvan. Beale returns as the team’s leading punt returner. A first-team All-KCAC special teams selection, Beale recorded 16 punt returns for 248 yards and one touchdown. He averaged 15.5 yards per punt return, a statistic ranking fourth nationally. Meanwhile, Johnson returns as Tabor’s leading kick returner. He returned 20 kickoffs for 517 yards and one touchdown. He averaged 25.9 yards per return, a statistic ranking 15th nationally. He ranked 23rd in kickoff return yards. Gardner said the team and his staff will need to embrace change to accommodate the strengths of the athletes the Bluejays will field this season. Tabor was picked first in both the preseason coaches’ and media polls at the 2017 KCAC Football Media Day. The Bluejays ended the 2016 season ranked 12th nationally and will start the season ranked 10th in the NAIA Coaches’ Top 25 preseason poll. Gardner said his outlook for the season remains unchanged. The Bluejays will start the season hosting Morning­side Sept. 2. Kickoff is scheduled for 1 p.m.
Tabor’s season has ended at the hands of the Mus­tangs the past two years, including a first-round NAIA playoff loss in 2016, 65-17, and a national quarterfinal loss in 2015, 51-6. “This year we’ve got the No. 4 ranked team coming in here, and I want to see how our guys are going to be able to run our stuff versus a high-powered offense and run our stuff versus a defense that only gave up, I think, 12 points a game last year,” Gardner said.